So many ways to spend a gift card at Target! Thanks for the giveaway! 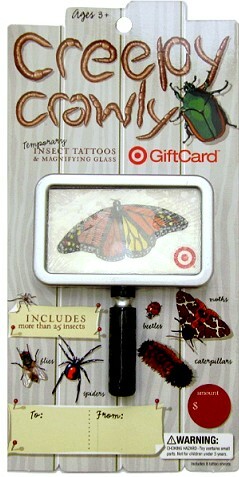 I ♥ Totally Target on FB! Thanks for the chance to win this week! this gift card seems so cool, I’d love to win this! Would love to win 🙂 Thank you!! I also have already liked you on FB. Thanks! I can’t imagine a gift card like this. Guess I will just have to see it up close. Please….Thanks for all the chances you give us to win some of the most unique gift cards ones imagination can design. Happy weekend to you. I like you on facebook…. Love Totally Target! Cute card! I like totally target on fb!! PLEASE PICK ME.! target is the only store around my house! Thanks for all you do, love the blog. I follow Totally Target on Facebook. Great giveaway. Would love to win! Woo Woo I love give aways! I Like Totally Target and I would Love a Creepy Target Card Too. Thank you for the giva a ways. I hope I win. This would really come in handy. I already like TT on Facebook – thanks! I want to win one! Thank you for all these giveaways you do!